This document is our stated policy as of October 1, 2015. Any specific questions can be directed to a Customer Success Manager or Product Manager at MuleSoft. 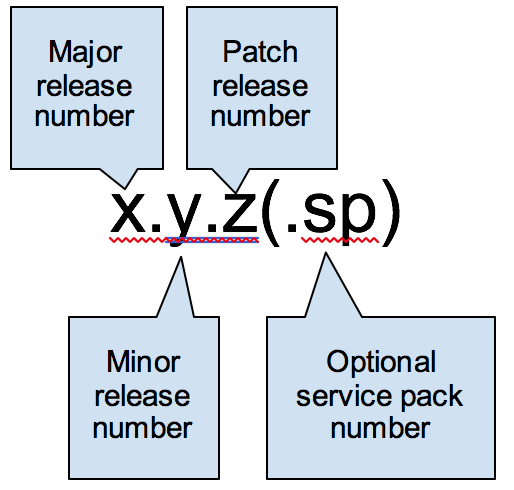 Semantic versioning scheme is based on a release number which has 4 components: Major release number, Minor release number, patch release number, and an optional service pack number. A Major release means modifications or enhancements to the same Software product as designated by a change in the Major release number. Major Releases do not include separate or different products marketed by MuleSoft under a different name even if such products are compatible with the relevant Software product. Technical support on the use of the software, assistance with application configuration, and guidelines on performance tuning. Application code review is not within the scope of this service. MuleSoft will attempt to provide patches for customers upon request, and where technically possible, for the following: S1 issues; Critical Security Vulnerabilities; S2 issues where the product in a non-production environment is nearing a critical milestone, is unusable, and no workaround is available. Customer may also request patches or fixes for non-S1 issues, although MuleSoft makes no guarantees about its ability to provide a patch. If a patch is not provided, the Customer is required to upgrade to a future release for the requested capabilities or fixes. Access to software downloads, technical content and knowledge base articles. Compatibility support and certification of runtime environments for the published supported environments and third party software as documented in the MuleSoft documentation at time of release or detailed in the release notes of any maintenance release. Extended Support is provided for products which exist under previous support policies (see below) and can be granted on an exception basis for a product at MuleSoft’s discretion. Technical support on and around the software for production environments, including troubleshooting, diagnosis and resolution of issues which do not require source code patches. Products that are not covered by Standard Support or Extended Support shall be considered End of Life. End of life support will be provided for an additional 12 months after Standard Support and Extended Support end. End of Life support will be limited to technical assistance only with no source code patches or new patch level releases. Support will provide recommendations on what is possible for the Customer, including professional services, references to documentation or knowledge base articles. Patches will not be provided. If there is an issue that requires a patch, you will need to upgrade to a newer version covered by the Standard or Extended Support windows. After End of Life support expires for a product, MuleSoft will not provide support of any kind. Patch the MuleSoft Cloud Offerings as required. In both cases, the targeted timeline for such updates will be 30 days or less. For vulnerabilities discovered in MuleSoft Cloud Offerings or Software, MuleSoft will respond to any incoming report of discovered vulnerabilities from the security research community by evaluating the report and assessing its impact and exploitability, calculating and assigning an appropriate CVSS score. Once the score has been derived, MuleSoft will determine the appropriate course of action for developing and disseminating a fix. When such a vulnerability is assigned a “high” score (>7.0), MuleSoft will treat the issue as critical, and where possible, will prioritize the fix ahead of existing development schedule. Mule is the runtime engine of Anypoint™ Platform. The following maintenance policies apply to on-premises, cloud and hybrid deployments of Anypoint Platform, including Mule Workers in CloudHub, API Gateways running on-premises or in the cloud and the Mule runtime deployed to a Customer’s own data center (previously referred to as Mule ESB). Mule runtimes follow semantic versioning. MuleSoft provides Standard Support for the latest released minor version of the Mule runtime. Once a new minor version for a major version is released, the previous minor version will receive Standard Support for an additional 18 months. All minor versions for a major version will receive Standard Support for a minimum of 2 years. Starting with Mule 3.7 and later, after Standard Support ends, MuleSoft will offer Extended Support for an additional 2 years. Mule 3.5 and 3.8 will receive Extended Support for a total of 3 years. Extended Support versions are only available on CloudHub for applications already deployed on it. Once a new major version is released, MuleSoft will continue to offer Standard Support for at least one minor version of the previous major version for a minimum of 3 years. Once a minor version is outside the Standard Support and Extended Support windows, MuleSoft will provide End of Life Support. End of Life versions will not be available or supported on CloudHub. Applications running on End of Life runtimes on CloudHub will be stopped when Standard and Extended Support end. MuleSoft reserves the right to End of Life Support a CloudHub runtime for a particular patch version of Mule runtime with 90 days notice due to critical security vulnerabilities that are fixed in a subsequent patch release. All MuleSoft Customers prior to October 1, 2015 were grandfathered with the following policy: For versions prior to Mule 3.5, MuleSoft provided Extended Support through December 31, 2016. All other 1.x API Gateway versions reached end of Standard Support on October 1, 2016, and will have End of Life support until October 1, 2017. The following tables summarize the current status of the supported Mule versions. Mule Management Console (MMC) was deprecated in December 2015. MuleSoft will provide Standard Support for the latest version until the End of Standard Support for Mule Runtime version 3.5, when MMC will be End of Life. The following tables summarize the current status of the supported MMC versions. Anypoint Studio follows semantic versioning. All versions of Anypoint Studio are forward compatible. Versions cannot be downgraded. MuleSoft provides Standard Support for the latest minor version of a Major release. It is expected that customers upgrade versions of Studio in order to receive enhancements, bug fixes and patches. Anypoint Connectors follow semantic versioning and have 4 categories: Premium, Select, MuleSoft Certified and Community. MuleSoft will provide Standard Support for the last Major or Minor version of a Select or Premium connector and for 1 year after release of the next Major or Minor version of a connector. After this, MuleSoft will provide End of Life Support. Updates to Minor, and maintenance versions of connectors are all backward compatible unless a non-compatible change is introduced in the underlying API itself that the connector connects to. For non-compatible changes outside MuleSoft’s control, MuleSoft will indicate in the release notes any non-backward compatible changes to the connector. MuleSoft Certified connectors are developed by MuleSoft’s partners and developer community and subsequently reviewed and certified by MuleSoft. For these connectors, MuleSoft will take initial calls from customers and isolate the issue for resolution. MuleSoft disclaims any additional support obligation for such MuleSoft Certified Connector. For support of MuleSoft Certified Connectors, customers should contact the MuleSoft partner that created the connector. Community Connector customers have access to Customer Support who troubleshoot to ensure that all licensed components of the platform are working as designed. If the Community connector is the source of the issue and assistance is required to modify or alter the connector, MuleSoft Professional Services or an accredited MuleSoft Partner can be engaged by contacting their MuleSoft Account Manager. MuleSoft will provide Standard Support for the last major or minor version of Anypoint Connector DevKit and for 1 year after release of the next major or minor version of Anypoint Connector DevKit. After this, MuleSoft will provide End of Life Support. For our Cloud Offerings, there is one current version that is supported at all times and upgrades are done on behalf of the user. Cloud Offerings use date based versioning. Cloud Offerings are backward compatible with all currently supported runtimes. All minor and major versions will receive Standard Support for a minimum of 12 months from the release date or until 9 months after the release of the next major or minor version, whichever is longer. Once a new minor or major version is released, only critical security fixes will be backported. Backporting will only be done for supported versions of the software. Patch Releases will contain cumulative fixes which MuleSoft considers necessary for the proper functioning of the software. Once a minor version is outside the Standard Support window, MuleSoft will provide End of Life Support. Anypoint Platform Private Cloud Edition will release major/minor updates approximately twice a year. Anypoint Platform Private Cloud Edition updates must be made sequentially to ensure compatibility. For example, if upgrading from 1.5 to 1.7, you must first upgrade to 1.6 before moving to 1.7. The following tables summarize the current status of the supported Anypoint Platform Private Cloud Edition Versions. The latest minor release of a major version will receive Standard Support. Previous minor and patch versions of the same major version will receive Extended Support. It is expected that customers upgrade minor and patch versions of Runtime Fabric periodically in order to receive enhancements, bug fixes and patches. Once a new major version is released, the last minor release of the previous major version will receive Standard Support for 6 months, and Extended Support for an additional 6 months. Once a major version is outside the Extended Support window, MuleSoft will provide End of Life Support. Anypoint Runtime Fabric upgrades may need to be made sequentially to ensure compatibility. For example, if upgrading from 1.0 to 3.0, you may be required to first upgrade to 2.0 before moving to 3.0. The below policy applies only to the Anypoint Platform Service Brokers for PCF (tile) distributed on Pivotal.io, which is included as part of the Anypoint Platform for Pivotal Cloud Foundry solution. Other components of this solution such as Anypoint Platform Private Cloud Edition and Mule Runtimes are subject to their individual versioning and back-support policies. MuleSoft will only provide support and patches for Elastic Runtime versions which are supported by Pivotal Cloud Foundry* and which are also compatible with supported MuleSoft product versions (as stated in release notes). The following tables summarizes the current status of supported Anypoint Platform Service Brokers for PCF.